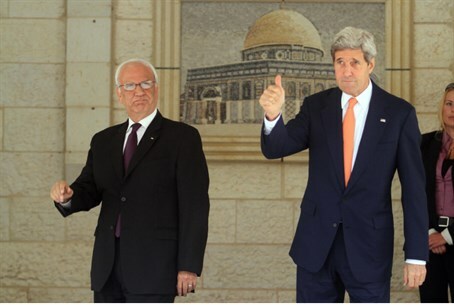 State Department spokeswoman says Kerry will meet PA negotiator Erekat but will not unveil an American peace plan. U.S. Secretary of State John Kerry on Monday was to meet the Palestinian Authority’s chief negotiator but would not unveil an American peace plan, an official said, according to AFP. "There are no current plans to introduce a peace plan," State Department spokeswoman Jen Psaki said, dismissing reports that proposals would be laid on the table during Kerry's meeting with Saeb Erekat in Washington. "It's up to the parties to take steps," Psaki said, adding, "We know what the issues are, we know what the conditions would be, but it's up to them. So we're only going to take steps that we think would be productive." Kerry was able to force the sides into a six-month negotiation period, but the PA torpedoed those talks by requesting to join 15 international agencies in breach of the conditions of the negotiations. Lately, PA Chairman Mahmoud Abbas has been promoting a unilateral move at the United Nations, as he plans to ask the Security Council to set a timetable to “end the Israeli occupation” and force Israel to withdraw from Judea and Samaria. Fatah leader Nabil Shaath recently threatened Israel with a “political war” if there is a negative response to Abbas’s steps at the United Nations. Abbas himself has threatened to cut ties with Israel if his latest unilateral move at the UN fails. Meanwhile on Monday, Psaki blasted Israel for approving plans for 500 homes in Jerusalem. "It would be unfortunate" if after "the unequivocal and unanimous" opposition of the U.S. and international community "Israeli authorities would actively seek to move these plans forward," Psaki said, according to AFP. She insisted the United States would be "willing to be a capable partner" if there was a move to resume negotiations, but said there was no current "evidence of that." On the part of Israel, Psaki said, "If they were going to restart a peace negotiation, we would be seeing actions and we'd be seeing efforts on their part to do that."